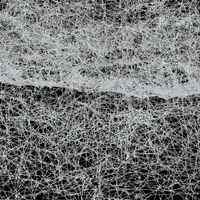 Scientists engineer E. coli to produce artificial spider silk. Researchers have produced the first recombinant spider silk that mimics the toughness of the natural material, according to a study published last month (February 16) in Advanced Materials. The key to their success was including domains of the silk protein that help silk strands form properly. 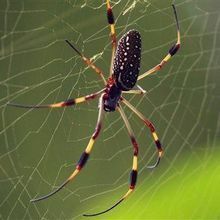 Scientists from the University of Bayreuth in Germany expressed variants of one of three spider silk proteins from the European garden spider (Araneus diadematus) in E. coli. Previous studies only used versions of the protein containing the two central domains, which create a tough crystal-like structure nestled inside a stretchy gel-like material, but the Bayreuth team included two domains that naturally occur at the ends of the protein. “They do not contribute to the final structure and performance, but we found they are actually important in getting the molecules aligned,” study coauthor Thomas Scheibel told New Scientist. 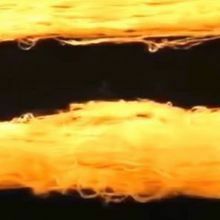 After the bacteria produced the protein, the researchers allowed the silk to self-assemble in a bath of water and alcohol before stretching the fibers to six times their original length. 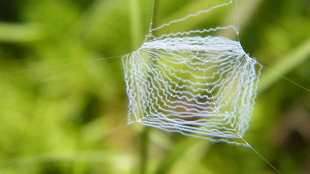 This process of “wet spinning” mimics a spider drawing the silk out of its body with its hind legs, which improves the alignment of the proteins as well as the fiber’s toughness. 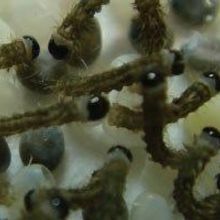 The researchers found the recombinant fibers were more elastic but weaker than real silk. However, because toughness is a combination of elasticity and strength, the artificial fibers were deemed as tough as the natural product. If the process could be scaled up, it might be useful for creating airbags with higher elasticity, Scheibel told New Scientist.